Negative bond yields (e.g. -0.04% on 2 year gilt) mean that those who hold the bond to maturity will receive less than the value of the bond. A negative bond yield is usually very rare. In normal circumstances, investors require some yield (interest) to give an incentive to buy government bond. There is no good reason to buy a government security (bond or gilt) if it was going to lead to a loss. You would be better off holding cash. In the UK, British securities entered a negative bond yield for the first time. 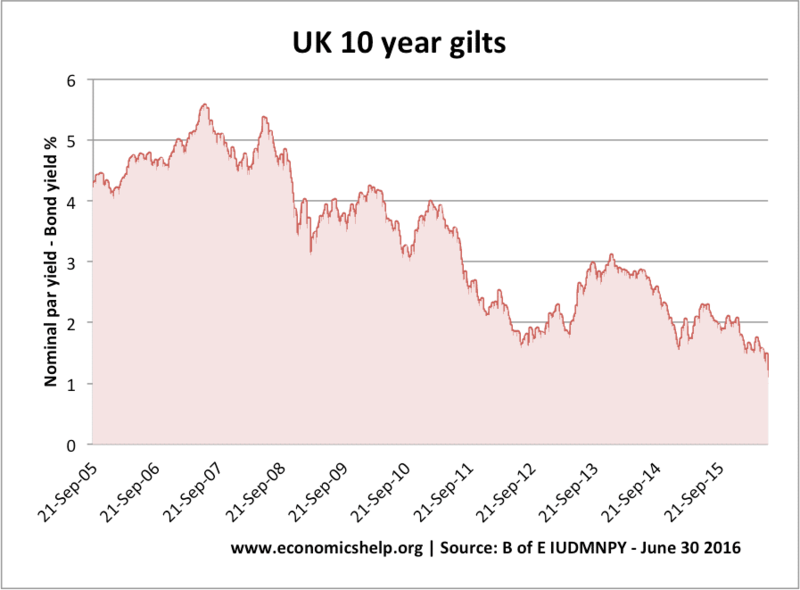 Two year gilts fell to -0.003 per cent. 10 year bonds are still positive. But, you can see the downward trend in bond yields as interest rates head lower. This is partly due to expectations Bank of England will not cut interest rates to 0%. Also, post-Brexit investors are more pessimistic about the economic future. Why would people buy negative bonds? Flight to safety. In some circumstances, people would rather have a small negative rate on bonds compared to potentially bigger loss elsewhere. For example, if you expect a recession, you may want to completely avoid more risky company shares, which could fall – but instead buy a government bond which you believe will hold its value. With falling commodity prices and falling share prices, bond yields may look attractive despite very small negative yield. Portfolio investment. As part of a diversified investment plan, pension funds and investment trusts may wish to keep a % of their funds in government bonds to maintain a certain reserve. Similarly commercial banks may need to hold gilts to maintain reserve ratios. Quantitative easing. Central Banks may be buying bonds as part of a quantitative easing programme and therefore there is an unusually high demand for bonds. Deflation. If a country experiences deflation (e.g. inflation rate of -1%), then a negative nominal bond yield of -0.04% still can give a real positive return for the investor, because the bond is falling in value at a slower rate than cash reserves because of deflation. What at the implications of negative bond yields? Expectations of low growth / deflation. Usually negative bond yields are an indication that investors expect some form of economic downturn. It is this negative expectation which encourage investors to choose the safety of government bonds rather than commodities or share prices. In addition, negative bond yields are a sign investors expect deflation. Deflation usually accompanies prospects of lower economic growth. Lower government debt interest payments. Falling bond yields reduce the annual interest payments on UK public sector debt; it means it becomes much cheaper for the government to borrow. Many economists argue that combined with decline in private sector spending, low bond yields give a good reason for government to borrow more in order to fund public investment. Strong demand for buying government debt. Some fear higher government borrowing can lead to default and rising bond yields. But, falling bond yields is an indication demand for buying government debt is high and investors have full confidence there will be no kind of default.